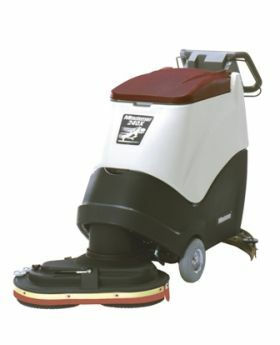 The Minuteman 240X walk-behind scrubber offers quick wet scrub and dry vacuum in one pass. The 240X is built operator friendly with a simple control panel, and individual forward and reverse bail levers. Available in a Base Model and Quick Pack. The 240X walk-behind scrubber offers a cleaning path of 24" and covers 25,500 sq ft/hr. The 24" offset scrub head allows cleaning in tight areas and corners.